Gulf Front Beach suite ... On the Beach. You can't get much closer to the Gulf. Sleeps up to 8 . Enjoy the views ! With 2+ bedrooms and trundle beds on the sleeping porch it can accommodate up to 8. Walk out on the private deck and you are right on the beach. Get comfortable under the gazebo and enjoy the amazing sunsets. Cook in the large kitchen outfitted with pots. pans, coffee maker, micro,blender for daiquiris and margaritas, and extra large refrigerator....all the comforts of home. The owner Curtis Westphal: My wife Kathy is a part time school teacher and I am a city planner. We lived in Florida and met in college then headed west in search of adventure where we settled near Golden. The Rocky Mountains are out our back door. A couple times a year we hop on a flight and come down to relax on the beach and visit our relatives in Largo and Sarasota. I grew up here. My grandparents bought the island estate in 1966 for the remarkable price of $28,000 and turned the home and carriage house into 6 vacation rentals. They had the pleasure of watching 4 generations of beach goers come to enjoy fun in the sun. When they got into their 80's they retired and moved to the mainland. My wife Kathy and I thought it was too nice to sell so even though we live in Denver we bought it. Fortunately. we have a great manager and handyman close by to greet our guests and get them settled in and care for their needs. We have 2 sons that we take on vacation each summer. Historically, the most beautiful spot on the tropical barrier islands of Tampa Bay between Clearwater and St Pete. You can hear the gentle surf from your beachfront apartment. You really can't get much closer to the Gulf. Fantastic views !! Large Kitchen with all the comforts of home. We really enjoyed our stay - the location is perfect, and we liked having a apartment in a house with fewer neighbors than a condo complex would provide. The beach chairs, kayaks and umbrellas were great. The unit we stayed in (#6) is in need of updating. The kitchen cabinets and bathrooms specifically. The house is almost 100 years old, quaint and charming, but kitchens and bathrooms were prob last remodeled in the 60’s or 70’s. It’s time for an update! Bathrooms are only accessible through bedrooms - it would be a good idea to rearrange enough to get a bathroom entrance off the main living spaces. This was our first time in florida and we couldn’t have been happier with staying here. Everything we wanted to do or see was right there. Restaurants, things to do, and right out the back door was the ocean. The property was amazing for our family and had everything you need for a day at the beach and then some. We were more than happy and would definitely stay again! The place is nice, kitchen is functional. was not aware it had two other units attached to it; could constantly hear people above us; maybe i did not read the description good enough and now the price makes sense in terms of what i paid. Going thru the bedrooms to access restrooms, which are tiny and outdated, was also a challenge. Having beach access, beach chairs, kayaks, a football, body boards, grills, etc was AWESOME. Would probably stay there again. Our family had a great time staying here. There was an activity for everyone: Our teenager was catching geckos; Most of us were at the beach all day long, swimming and bird watching; My husband went to the local bait & tackle shop, bought a rod and bait, and with their instructions, learned to fish right in the Gulf waters. There's games, books, and puzzles inside. There's sand chairs, umbrellas, inner tubes, and toys outside. There's lots and lots of restaurants, and, if you're coming from the airport, there's places to shop for groceries and sundries right on the path to the house. Thank you for taking the time to review Sun N Fun Beachfront properties. We are so happy to hear the whole family enjoyed their stay. There really is "something for everyone" here. Glad your husband got to experience fishing in the Gulf. There is nothing like the great location of this property...steps from the water. Hope to see you again soon for another great beach vacation. My friends and I had a lovely stay at this property. Owners were very helpful and communicative throughout the entire process. The property itself is very Florida-Beach Shabby Chic, but it has everything you need and is literally steps from the water. Can't go wrong! Thank you for the great review Veronica. It was a pleasure having you as our guest. Glad you enjoyed this beachfront property location and all the extras we try to supply for our guests. 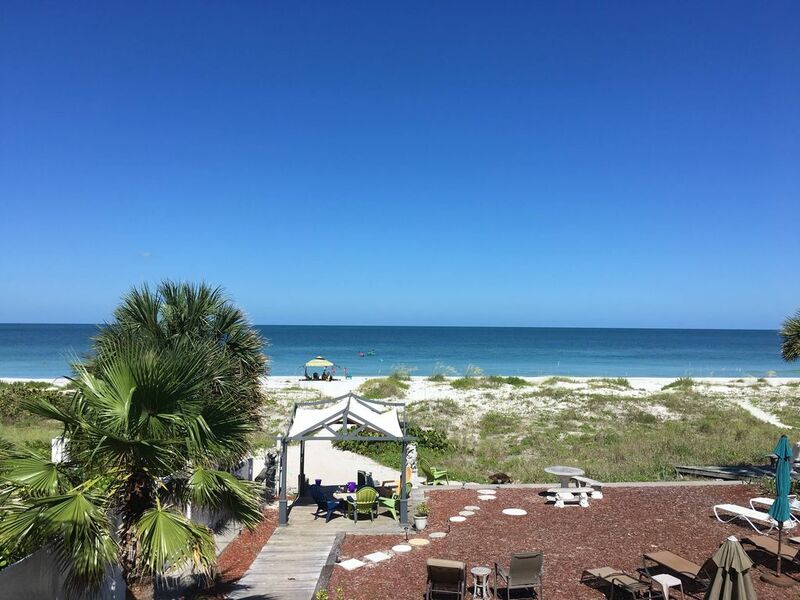 We hope to see you again your next beach getaway. Clearwater and its island beaches are fortunate to offer something for everybody. Our attractions include arts and museums, the natural environment, historical buildings, special events and more traditional 'attractions' such as theme parks, whatever your preference. The sampling of attractions below offers a little bit of everything. The Clearwater Marine Aquarium, home of Winter the Dolphin – just minutes from the Sun n Fun Beachfront vacation rentals. Winter the Dolphin has captured the world with her story of survival and determination. This heartwarming Warner Bros family film is based on the true story about a young boy who befriends an injured dolphin who lost her tail in a crab trap. Through their bond and friendship, the boy motivates everyone around him to help save the dolphin by creating a prosthetic tail to replace the one she lost. Winter’s strong survival instincts become an inspiration to people with special needs throughout the world. 3000 East Busch Blvd., Tampa (813) 987-5082. An extraordinary atmosphere filled with naturalistic animal habitats and shows, hair-raising roller coasters, Rhino Rally and more, dazzling live entertainment. 249 Windward Passage, Clearwater (727) 447-0980. A very unique natural attraction where one can view, touch and experience the biology and behavior of bottlenose dolphins, loggerhead sea turtles, Kemp's Ridley sea turtles, river otters, sting rays, local fish, coral reefs, mangroves and more. 701 Channelside Drive, Tampa (813) 273-4020. A world-class educational facility featuring nearly 5,000 aquatic plants and animals which tell the tale of water, native land and marine animals in Florida. 12175 125th Street North, Largo (727) 582-2100. Specialty gardens featuring Florida plants including wildlife nesting habitat, restored wetlands and natural bridges. 1101 West Sligh Avenue, Tampa (813) 932-0245. One of the top three zoos of its size in North America featuring more than 1,500 animals representing 350 exotic species including the manatee. 2750 Park Trail Lane, Clearwater (727) 462-6024. A showcase of the plant and animal species native to the area. Preserve featuring rescued and rehabilitated birds, reptilian, insect and fish displays, plant and energy exhibits, and nature trails through a diversity of natural Florida habitats, allowing viewing of native birds, insects, amphibians, mammals and reptiles. 4801 East Fowler Avenue, Tampa (813) 987-6100. Largest science center in the Southeastern United States and home of Florida's only IMAX DOME theater. Charter fishing boat for novices to avid anglers, the Phantom can accommodate you. Clearwater fishing specializing in four, six, eight, hour fishing trips. Captain Butch Ford will make you feel right at home fishing for Gulf fish. Pier 60, Clearwater Beach (727) 449-1036. A 'street' festival located on the promenade portion of Clearwater Beach's famous fishing pier, celebrating the setting of the sun and featuring artists, craftsmen and performers with weekend musical entertainment.